James had previously served with the 11th Bn.South Lancashire Regiment rising to the rank of Company Quarter Master Sergeant before being discharged to a commission to the Lancashire Fusiliers on 30th, July 1918 when he became a 2nd Lieutenant. It is not known how he died, he is simply recorded as "killed in action" on 11th October 1918, but it is interesting to note that on that date his company were actually in training in open warfare at La Bethune. STOTT - "In sad but loving memory of our son and dear brother James Stott, Lancashire Fusiliers Regiment who fell in action and was laid to rest at La Brague." Farewell dear son and brother dear, you left us all without a tear. You fought and died for those you love, and now you wait in heaven above. It is sad but true, we know not why, the best are first that are called to die. As well as being remembered in St.Ann's his name also appears on the War Memorial in St.John's the Evangelist Church, Ravenhead which suggests that his family may have moved to live in the area. At a special ceremony at the Warrington Road Cenotaph on Sunday 3rd July 2016, Rainhill village dedicated a new plaque bearing the names of 17 men with Rainhill connections who perished during WW1. These men's histories were found during Rainhill Civic Society's research. Rainhill Parish Council funded the plaque and organised the ceremony with Rainhill Civic Society, our local Churches and the Royal British Legion. James Stott is one of those names. 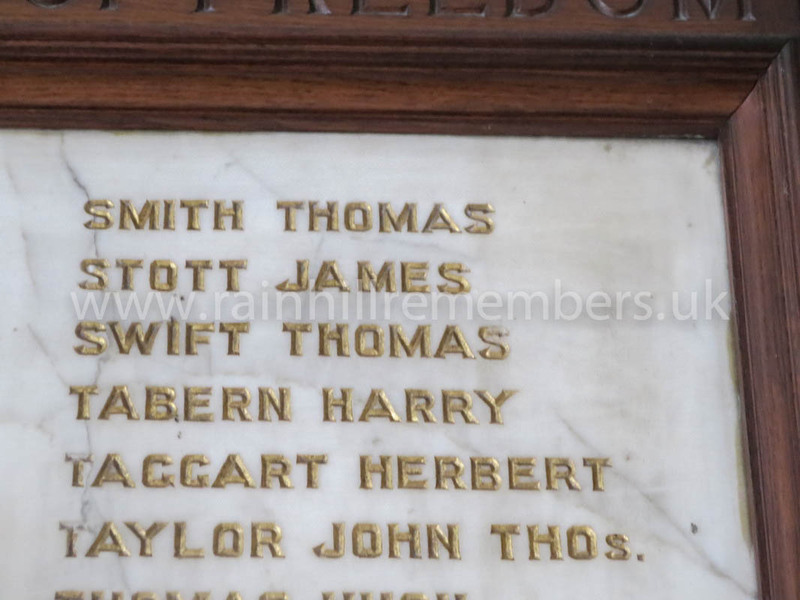 The Roll of Honour in St John's Church, Ravenhead, St, Helens has the name of James Stoot inscribed on it.